Rolling hills, rushing rivers and lofty mountains. Train rides through the Lake District are glorious. And, while there are only a few train services running throughout the Lake District, they are the most picturesque! 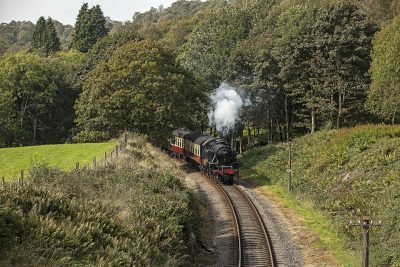 So for those of you who love trains – whether steam or electric – here is the low down on the lines and attractions. Running from Oxenholme to Windermere is the Lakes Line. It calls in at Oxenholme, Kendal, Burneside, Staveley and Windermere. The whole section of this track weaves through rural countryside and you’ll see spectacular views along the way. From dramatic hilly pastures, deciduous woods to cascading rivers and streams. 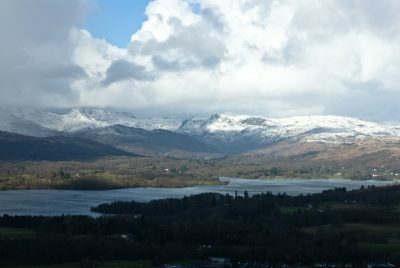 While the line does not carve through the mountains, it runs close to fantastic fells, such as Orrest Head and Helsfell Nab. The Lakes Line links the destinations on its route with direct services on the West Coast Mainline. Indeed, this is the perfect line to catch a train to combine a lovely train ride with a walk. A series of walks have been written by the late Mary Walsh. (An award-winning writer of walking books and a travel writer, who died in January). All the walks in this series start from the railway stations at Oxenholme, Kendal, Burneside, Staveley, and Windermere. Windermere station, at the end of the Lakes line, is as close as you can get to the central Lakes by train. This line is a great way to explore the area of Cumbria from Windermere to Kendal, without having to start-up your car’s engine. Also, there are many bus services connecting trains at Windermere station for onward travel within the Lake District. The Cumbrian coastal weaves around the majority of the Cumbrian coastline. This makes it a spectacularly scenic route. It follows the coast from Lancaster in the south (north Lancashire) to Carlisle (the northern reaches of Cumbria). It is definitely worth stopping off along the way at some of the little Cumbrian villages and towns. This includes the Victorian seaside town of Grange-over-Sands. Other lovely stops along the way, include: Cark; Dalton-in-Furness, Ravenglass, St Bees and Whitehaven. Many of these towns and villages have lots for tourists to do and see, such as Holker Hall. 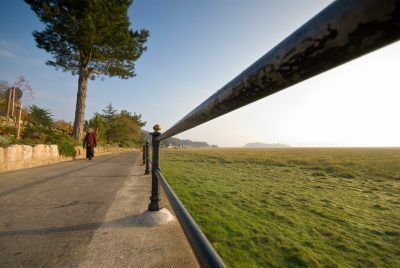 And, with the line running close to the coast, there is the link with waters of the Solway and Morecambe Bay. Both are sites of special scientific interest (SSSI). It has an historical offering too. The line traces many thousands of years of history. It circles ancient stone circles, historic ports, Hadrian’s Wall, and centres of mining and industry. Find out more here. The smell and sound of a classic steam train – you can’t beat it. And, with the Ravenglass and Esskdale Railway you get the nostalgia too. It’s miniature train – affectionately known as La ‘al Ratty. And, it journeys a wonderful 7-miles of the western Lake District, over fells to the Cumbrian coast. Ravenglass is the only coastal village in the Lake District National Park. And, from here, you can travel to seven different places en route to Dalegarth and Boot Station. It was originally constructed to carry iron ore from Eskdale’s mines to the coast. In the mid 1930s the Ravenglass-to-Eskdale line was the shortest passenger railway in the world. An, now it is a popular tourist attraction. 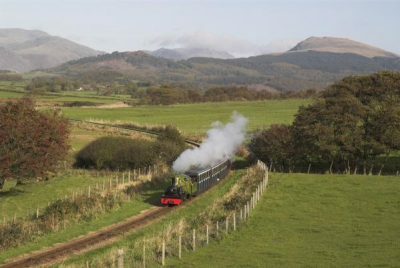 The operation has been preserved thanks to the Ravenglass and Eskdale Railway preservation society. It supports the operation of the railway and relies heavily on volunteers. Daily steam trains run from the end of March to the beginning of November, see the timetable. Dogs are welcome onboard and so are bikes, although, they need to be pre-booked. 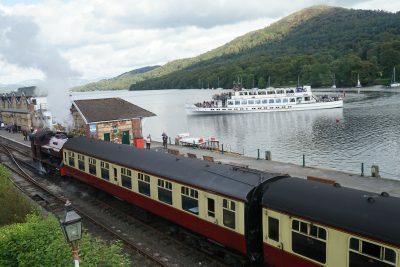 Whether you are a train-lover or looking for a lovely day out, then step back in time, relax and enjoy a 40-minute ride through the Lake District National Park. Its slogan is: “The Perfect addition to you Lake District Adventure” – and they’re not wrong. 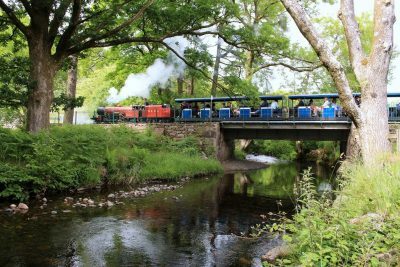 At Haverthwaite Station, climb aboard a steam engine and take in the most beautiful lakeland countryside. The railway has 7 steam locamotives, including the 42085 (BR Fairburn). And, 8 diesel locomotives, including the 7120, Class 11 (English Electric). There is a stock of carriages, which include the 5 (Royal Saloon) – built in 1898 at GER Stratford. So, there is heaps of great interest for train-lovers. And, how about becoming a train driver for the day and controlling your own locomotive? You can even bring three friends and share the adventure. The railway hosts plenty of themed days too. There are popular kids character to witches and wizards events, Easter and Christmas specials too. There are even pensioner days, when discounts are available. Get your timetable and get going! With picnic area, adventure playground, engine shed and much more, it’s not just a day out for train buffs among you, but the whole family too. Hopping on the train and leaving your car at home is a great way to see Cumbria and the Lake District, and helps to reduce your carbon footprint while you holiday with us. You can get here via the West Coast Main line – which runs south to north and connecting many large cities in England and Scotland. The West Coast Main Line runs south to north stopping at Oxenholme Lake District, Penrith and Carlisle. Getting to the Lake District via the Settle-Carlisle line – one of the most iconic railway lines in the country – is a picturesque journey. You can travel from to Cumbria from west and south Yorkshire on this line. We love the Lake District and want to preserve it for generations and generations to come. And, travelling on other modes of transport instead of your car, is a great way to help preserve this beautiful environment. So, whether you are a train fanatic or not, why not travel to the Lake District by train – you’ll be glad you did! From the southern shores of Windermere to the high fells of Keswick, we have more than 450 self-catering holiday homes for you to choose from. They are all VisitEngland inspected and graded and so you can rest assured that the quality is top-notch. We have no problem you bringing your dogs too and have plenty of dog-friendly cottages for your stay. Just have at look at our Lake District Holiday Cottages or call us on 015294-88855 to book.